At the start of March, in a span of just 48 hours, several big names in the American mall industry announced they would be slashing store counts to the tune of over 300 stores. 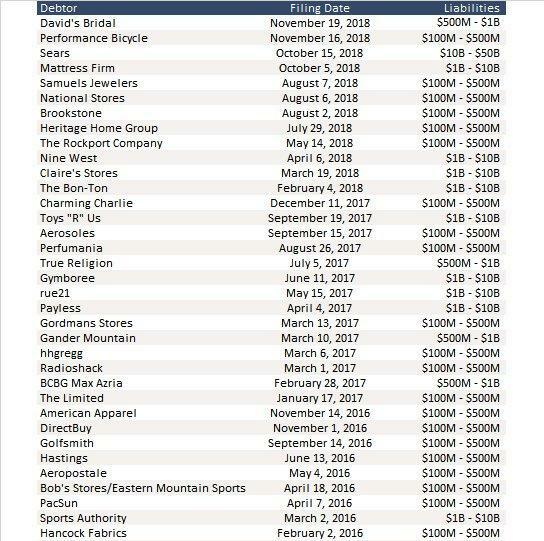 Gap (GPS) said during its earnings call that it is going to shutter 230 locations over the next two years, just hours after JCPenney (JCP) said that it would close 18 of its department stores. This news came after L Brands (LB) said they were going to close 53 Victoria’s Secret stores in North America this year according to Bloomberg. The icing on the cake was when "disruptor" Tesla (TSLA) recently announced all of its sales would be moving online, which was a nice way to say that almost all of its retail locations - many of which are located in malls - were going to close (since then Musk appears to have flip-flopped and as of this moment, the fate of Tesla's retail operation remains unknown). So, as a result of this ongoing default tsunami, malls are becoming increasingly mere vacant lots, a few scattered fashion retailers, Apple (AAPL) stores and food courts, primarily just feeding Apple employees. And while the idea of imploding malls is not new, as the industry did seem to stabilize at one point as the cost of gas fell and consumer confidence rose, it now appears that the eye of the hurricane may have passed, and the tide is heading out once again, as vacancy rates at US malls jumped to 9% in the fourth quarter of 2018, up from 8.3% the year prior. Helicopter money, the only way to get money into the hands of people who will buy American goods here in America.